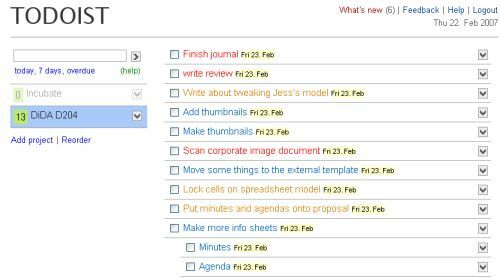 Today I discovered an amazing tool for creating to-do lists – Todoist.Â Â It’s similar to the other 5000 to-do-list apps out there with an important difference – it’s usable. Unlike most widget apps, it’s fast and accessible from anywhere.Â Unlike most other Web 2.0 organization apps, it is completely free of bloat and a pleasure to use.Â It is ridiculously light and doesn’t require a mouse for operation. Go on, sign up for an account.Â Try out some of the great hotkeys – like ‘a’ for a new item, ‘ctrl – left/right’ for indents, and the tab key actually works in a useful order – from the name field to the date field, to add and then to cancel.Â The date field is smart, too – it recognises dates such as ‘tomorrow’, ‘in a week’ and so on. Just the thing for those end-of-project checklists, work deadlines and lists of blogs you simply must write. Posts on GTD and photography for Scenes and Emos in the pipeline, but just a quick update – something that I discovered working on a website for a school project earlier. If you’re not into webdesign, give this one a miss. If you’ve any experience in semantic webdesign/xHTML+CSS, you will know how… well, frankly what an arse IE is to code for. One of my pet hates is the way that it handles the :hover pseudo class. Firstly, it only works on links, and secondly, I personally have encountered a large number of seemingly unexplainable errors that occur after the link has been followed. It is easy to remember this if you remember that you will have a love/hate relationship with pseudo classes – that’s link visited hover active. This is fair enough, but sometimes certain properties won’t work after the link has been followed in IE<7. Leave off the :link pseudo class. Your styles will work (as far as I can tell) just fine, without the strange, seemingly random errors. If in doubt, add a blank and pseudo-classed selector for each link.